I was at first a little confused about this book's low average on GoodReads. Set in a quickly changing Neukölln apartment building, Mahlke tells the stories of a host of residents, each from a very different personal background but all having an unsettled account of their own. Reflecting on the low ratings, and my own 'merely sated' 3-Stars, I think one flaw is that these characters are either generic (Der Ägypter) or complex but frustratingly lacking context (Lucas' mother). Undoubtedly part of Mahlke's plan, the new agents of gentrification are never concretely present in the storyline, appearing only as small reference or, more often, personified by the bah-humbug grumblings of the Hauseigentümer Claas. Also unfortunate is the presence of only one Turkish-German character; Ümit serves mostly as an antagonistic voice for Lucas, as well as a kind of comedic-relief-overflow-valve. While I was hoping for a nuanced critic-vis-à-vis-community-biopic, "Rechnung offen" turned out to be a relatively limited foray into the consecuences of gentrification. Still, I found Mahlke's portrayal of Lucas to be entertaining and believable, and there is certainly some worthwhile commentary within the nearly 300 pages. Es dauert etwas bis man den Figuren ihre Geschichten zuordnen kann. 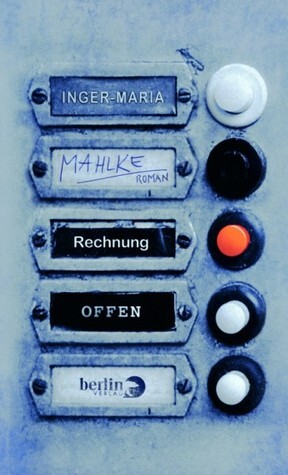 Dieses Buch braucht Zeit. Manchmal ändert sich die Ausgangslage eines Protagonisten durch einen Nebensatz. Das macht Spaß, macht es aber zu keinem Buch, das man mal eben am Strand liest.